Oh looks like fun. Note to self must dig out Easter craft sets that I bought cheap after Easter last year. Oh, Easter Bonnet time! That looks fab! We've yet to have our first experience of making one. Awwh the Easter Bonnet Parade... many a night arguing with the glue ! Can I join in? I love stuff like that! Oh I want to join in too! Fab bonnet! That's got to be winning some prizes? She's making a fantastic job of that! I can't believe how close Easter is now! Easter bonnet parade! She is so going to win with that one! Ahh Easter bonnet making! Wee Z needs to start his soon! Easter bonnets! This is something I'm so looking forward to in years to come. That Easter bonnet is looking fantastic! 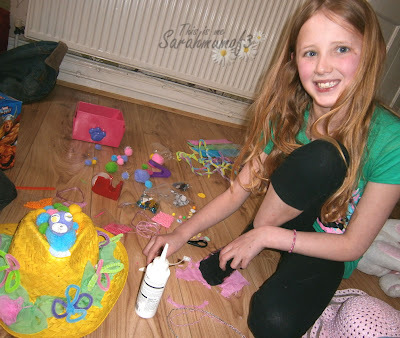 Now that looks like good creative messy play! I hope she has a parade to wear that too.